I am a Korean. So you might going to see some awkward article usages or numeric errors in my posts. One of the shortcomings of having a language that doesn't care much about numbers or articles as a mother tongue. How would Korean give you problems with English numbers? Well, actually the differences in the concept of what is countable and what is uncountable, along with some minor differences of when a noun should be in its plural form are what I meant. For instance, I might say 'Let me give you an advice,' because in Korean, advice is countable. Also Korean language doesn't require you to use plural nouns if the context tells you whether it is or not, or if the number doesn't have any significance to the meaning of the sentence. Like.. 'with raised eyes,' in Korean would be 'with raised eye,' because usually you have two eyes, and it doesn't really matter if you have one eye or two eyes in the context. Also without an indefinite article, I tend to leave out that oh-so-little-but-apparently-important part of language, let alone be easily confused if I should use it or make the noun plural. For instance, I might say 'I have a good news' because in Korean, news is countable. Also Korean language (or otherwise: "the Korean language doesn't...") doesn't require you to use plural nouns if the context tells you whether it is or not, or if the number doesn't have any significance to the meaning of the sentence. Like.. 'with raised eyes,' in Korean would be 'with raised eye,' because usually you have two eyes, and it doesn't really matter if you have one eye or two eyes in the context. Also without an indefinite article, I tend to leave out that oh-so-little-but-apparently-important part of language, let alone be easily confused if I should use it or make the noun plural. I see. Yes, I believe "differences" and "concept" are acceptable here. your tense/modal construction there is unnatural. I'm not sure how I'd rephrase it grammatically; perhaps "you'll maybe see" or "you might see" (here is one of the places where English demonstrably has past/nonpast rather than past/present/future). The easiest way to fix that is You might be going to see because "going to" is always preceded by a form of the verb "be", and "might" is always followed by an infinitive ... although it's pretty unidiomatic because the be is almost always present (is/am/are) or past (was/were). We don't tend to use "be going to" after modal verbs. It's probably a dialect thing but, to me, "you'll maybe see" sounds more unidiomatic than "you might be going to see". I'd always say "Maybe you'll see". I pretty much only use "maybe" at the beginning of the sentence, and only in other places when I've forgotten it at the beginning. "You might see" is even better, but probably only because it's short. Uhm, for the first one, no not realy, I guess the fact that I'm writing this with a phone makes me do that; the screen is pretty small. And I don't understand what your second question is, sorry. What two points?? I guess that's because I tend to think of the be-verb like the predicative-particle in Korean. And yes, Korean language has plurals, and I'm pretty sure that japanese has it too.. Unless by plurals you mean the word's form changing? We attatch the postfix to make a noun plural. And I don't understand what your second question is, sorry. What two points?? Oh, that. No, no particular reason there also. Usually we do that with '…' but with the phone '.' is much easier to type, and I didn't really felt the need to type three dots if I wasn't going to use the proper mark. Save time and energy I guess? If it's weird, I guess I can start using three dots. It's just that Koreans use punctuation marks as they like on the net, maybe because its role isn't that significant except for , . ? and ! 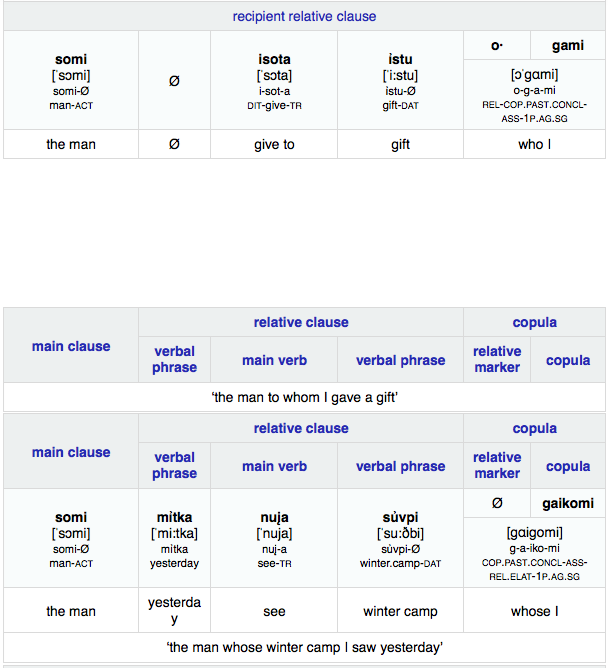 In Xuáli, the relative clause marker is derived from the attributive marker e (which is used to introduce adjective-like attributive phrases), plus the complementiser mi / -m. Relative clauses in Xuáli must have a resumptive pronoun (or rather a resumptive proform suffix), which means it's literally a bit more like "I saw the house that Jack built it." 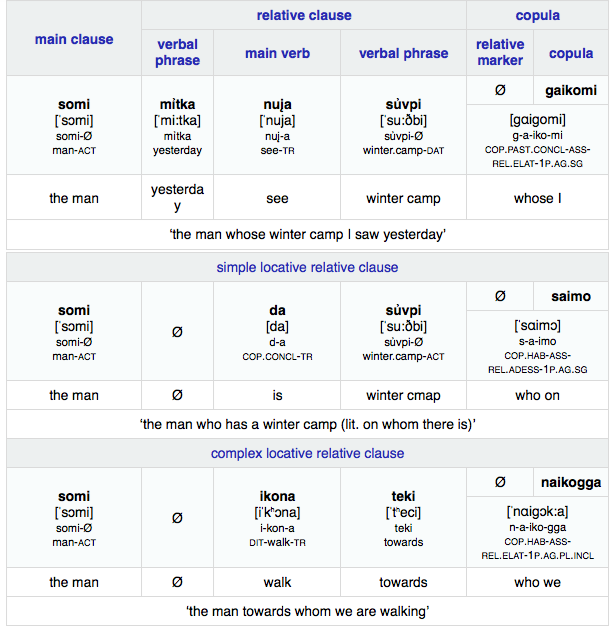 In relative clause in which the the role of the resumptive pronoun is a clause modifier (such as time, manner or place), the resumptive pronoun may either occur in an adverbial phrase at the end of the clause (as in the first example, or may be fronted to the beginning of the clause (as in the second example). 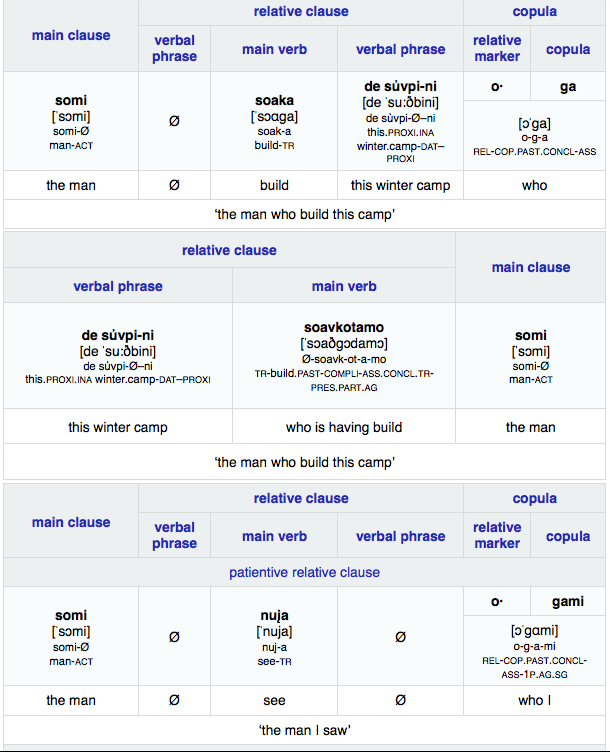 This fronting is possible in main clauses as well, and is handled the same way as topic fronting in Xuáli. A fronted phrase or topic may be followed by do (≈ 'then, thus') or a pause (indicated by a comma). "I saw the house that Jack was born in (it*). "I saw the house that, in (it*), Jack was born. Wait, is the ellipsis typed as one character on English keyboards? I always just write 3 dots, both in handwriting and on the computer. It's three periods, but some word processors format it specially. Funnily enough, typing a proper ellipsis is near impossible on a Chinese input method. Nəña lo mlu rɔma Tsakɔ xa mvoñuna ena. Nzɔ mlu rɔma Tsakɔ mvoñuna, nəña nzɔ ena. The house that Jack built, I saw it. Neya ada lu mlu rɔma Tsakɔ xa mvoñuna kə. I went to the house that Jack built. Nzo mlu rɔma Tsakɔ mvoñuna, neya ada kə. The house that Jack built, I went there. If the relativized noun plays an oblique role within the relative clause, it will generally be referenced by a demonstrative pronoun within the subclause, subordinated to the appropriate preposition. (In other words, Buruya Nzaysa uses a pronoun-retention strategy when relativizing oblique arguments.) Again, it is possible to topicalize the relativized noun. Nəña lo mlu rɔma Tsakɔ o xa tsɛsera ena. Nzɔ mlu rɔma Tsakɔ o nzo tsɛsera, nəña nzɔ ena. The house where Jack was born, I saw it. Seya rumɛ rɛ ɔdɔwa Tsakɔ tsə mlu mvoñu. Seya rumɛ rɛ so’ɔ(wa) rumɛ. I know that you know (it). And yes, Korean language has plurals, and I'm pretty sure that japanese has itthem too.. Unless by plurals you mean the word's form changing? We attatch thea postfix to make a noun plural. I'm like 99% certain that Japanese doesn't have any grammatical way of marking plural – you'd have to use a quantifier or a numeral. There is a Unicode character for the ellipsis, U+2026. It looks like this (brackets added for clarity) […]. On a Mac keyboard it can be entered with the Option-Semicolon key combination, on Windows with the Alt+0133 character code, in HTML with the &hellip; character reference, and in TeX with the \ldots command. Many word processing programs will automatically replace a sequence of three periods [...] with the ellipsis character. makes it sound like the pens are people. For a Simplified Chinese IME, press Shift 6. If by a Chinese IME you're talking about Microsoft's default IMEs for Traditional Chinese, then yes, you'd need to buy a special program to handle Chinese punctuation appropriately (or just download Google's IME, it's great for Traditional and most importantly, free). This explains why Taiwanese people who use Windows generally use English punctuation instead: ... (three Unicode points) instead of … (one Unicode point), ! (variable width) instead of ！(fullwidth), etc. Last edited by Ser on Sun Oct 23, 2011 1:42 pm, edited 2 times in total. For a Simplified Chinese IME, press Shift 6. If by a Chinese IME you're talking about Microsoft's default IMEs for Traditional Chinese, then yes, you'd need to buy a special program to handle Chinese punctuation appropriately (or just download Google's IME, it's great for Traditional and most importantly, free). I use Google Pinyin on Windows and SCMP on my Ubuntu laptop. I do agree that Google Pinyin is the best one. I really hate seeing the ellipsis character in a monospaced font for exactly this reason. It doesn't look right. I never use it if I can help it. I also absolutely despise the fi and fl ligatures that come up in so many fonts (including the one I'm using, goddammit). Again, they look absolutely terrible in monospaced fonts. I've read at least one book which had sections in monospace to denote a computer conversation where the automatic replacement of fi and fl with their ligature counterparts, and of ... with …, made the whole thing look unnatural and jarring. What is a computer conversation? To be honest, the idea that the advantage of using U+2026 is gaining space is just a hypothesis of mine, otherwise I think it's pretty damn pointless that MS Word automatically changes every ellipsis to it. A conversation that in the narrative is carried out via the medium of the internet and/or computers... What else would it be? I'm like 99% certain that Japanese doesn't have any grammatical way of marking plural –you'd have to use a quantifier or a numeral. Oh.. didn't know that. I thought -達was equivalent to -들, but maybe not. I only learned basics of basics when I tried to learn Japanese. The fact that I'd have to memorize a whole bunch of Chinese characters just made me give up. Ah, and by the way thank you for correcting those. I love when my English gets corrected; helps me learn. Your Korean is fine. We can use it that way, only we normaly wouldn't. Unless there is a significance to whether there are pens or is a pen, we'd drop the -들. Your Korean is fine. We can use it that way, only we normally wouldn't. Unless there is a significance toit's important/significant whether there are pens or is a pen, we'd drop the -들.
I should clarify that Bob knows far more Japanese than I do, although I'm going to Japan next year and need to start practising... the kanji do put me off as well though, I have to say. There are obviously ways that you can mark plural in Japanese, as he demonstrates, but evidently it has some kind of pragmatic function too that "makes it sound like the pens are people". Also, the fact that neither the Japanese -tachi nor the Korean -deul are obligatory is important; in English it very much is obligatory to mark number on nouns. That's where the difference lies between our languages. I just found out how to do it in Microsoft's "New Phonetic" keyboard layout for Traditional Chinese (the Bopomofo one): if you restore the language bar, you get the option of using "half shape" or "full shape" Latin letters and punctuation. If you select "full shape", you can type it by inputting a hyphen, pressing the down key, pressing the number 2, and then Enter. But it's still much more laborious than a simple Shift 6. Just use Google's IME with Traditional Chinese on anyway. Nonetheless, it's indeed impossible to use Chinese punctuation in Microsoft's Cangjie and Fast Cangjie keyboard layouts (didn't try the others). It's just retarded.